Round the County is always one of our favorite events, yet it is kind of a gamble with the weather. The race consists of a circumnavigation over two days of San Juan County, with an intermediate stop (ie, party) in Roche Harbor. It seems like on average you get one day with breeze and another without, yet last year in a once-in-a-lifetime event we had two days with breeze downwind all the way around! We had an excellent start on Saturday under gusty conditions -- we elected to start under Jib Top then fly the A2C when well clear. Since it was a reverse start we had the opportunity to watch how the rest of the fleet managed to hold on! Once we raised our A2 we quickly cruised through the fleet behind Braveheart who is considerably faster than us downwind in moderate breeze. By the time we reached Davidson Rock we had caught up to them and the drag race along the south side of Lopez commenced. 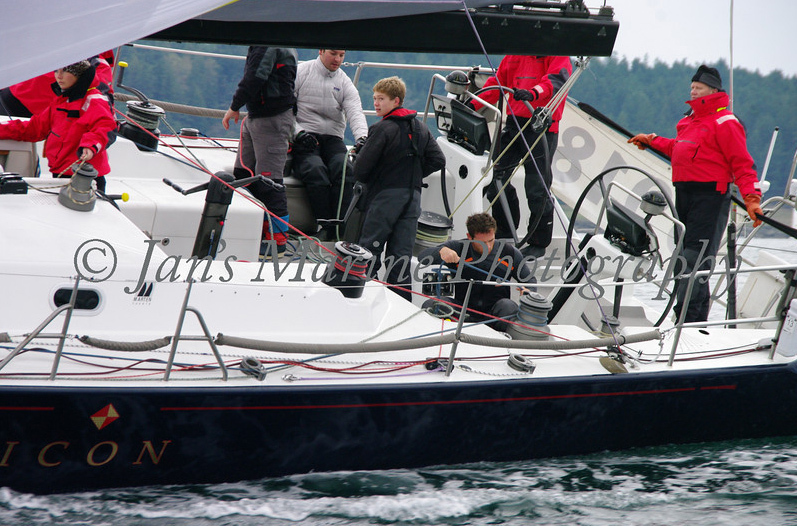 The reach turned into a beat along San Juan Island and we managed to finish ahead of them. On Saturday we had the remnants of the NE wind which was switching to a SE later in the day. The start line was heavily pin favored and there was a huge cluster which forced us and Braveheart to go around and re-start up the line. In the end this didn't hurt us much as we quickly moved out in clear air. By the time we reached Turn Point we were ahead of Braveheart and held onto our lead to the finish. After Turn Point we headed over to the Canadian Short and worked the current river while keeping a loose cover on Braveheart. 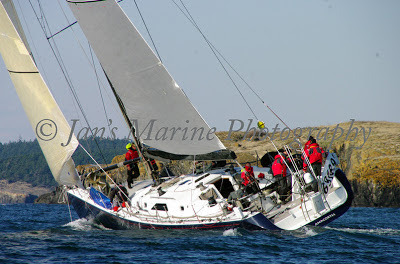 Unfortunately after rounding Patos the flood was still on our nose giving the advantage to those boats behind us. Near Clark Island we managed to wrap kelp around our rudder & keel, forcing a costly back-down which cost us a couple of minutes. Once rounding Pt Lawrence we set the jib-top and genoa stay-sail and sailed the rhumb line to the finish. 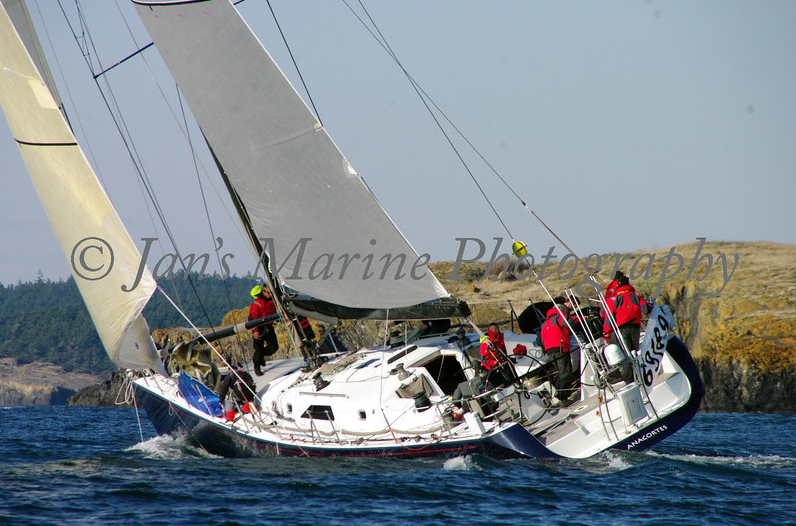 Braveheart set their kite and went very fast for the beach, then switched to up-wind sails for the run to the finish. In the end we beat them across the line by approximately 3 minutes, with the rest of the fleet behind. In the end under the "new" ratings we got 5th in division bring an end to a great season -- now we focus our attention on getting our rating adjusted to something more reasonable & fair!